The new owners of this space have made some very nice remodeling changes and made a good effort to change the vibe for the better. It used to be the Emmigrant, supposedly an Irish bar, which was big and boring and suffered enormously by comparison with the Galway Arms right across the street. The Galway is small and lively, overflowing with interesting people, and remains a bar of considerably more character. 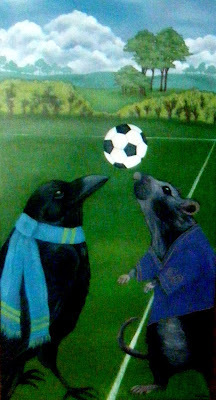 But thanks to the new ownership (expanding from Clever Dunne's on Capitol Hill), the Rat and Raven is now at least a pleasant change of pace. The R&R now includes a very nice, open, upstairs area, and hosts people playing not only pool and darts, but also shuffleboard, Scrabble and Texas Holdem. The drinks are unfancy, as you'd expect in the a university district, and the crowd, if not as interesting as across the street, is tad more pleasant than the previous one.